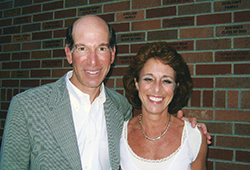 Barry and Susan Menashe have been long-time supporters of OJCF. They have also been great supporters of many other Jewish and secular organizations and programs including Cedar Sinai Park, B'nai Brith Camp, First Tee and the Oregon Jewish Community Youth Foundation in which their daughter, Lauren, was a participant. The Menashes are also the first OJCF donors to give away a farm. The proceeds from the sale of the 79-acre Tualatin Rainbow Farm became part of the Barry and Susan Menashe Philanthropic Fund. These funds have enabled Barry and Susan to continue to make a huge impact in our community. "We have always given but we want to do more," says Barry. "There are so many people in need and it is far more satisfying to give than to get." In addition to their donor advised fund philanthropic efforts, the entire Menashe family can be seen during the winter months on the streets of Portland handing out warm socks, hats and blankets to the city's homeless. OJCF is extremely grateful to Barry and Susan for their steadfast commitment to philanthropy and for helping to secure a strong future for our community.